I started learning to draw about fifteen or so years ago because I wanted to be able to do sketches of my dogs. I wasn't even trying to do good sketches of them. Just little scribbles to capture their postures and moods and so on--the things I love most about them. I still have a heck of a time drawing my dogs. But I do practice with other animals. 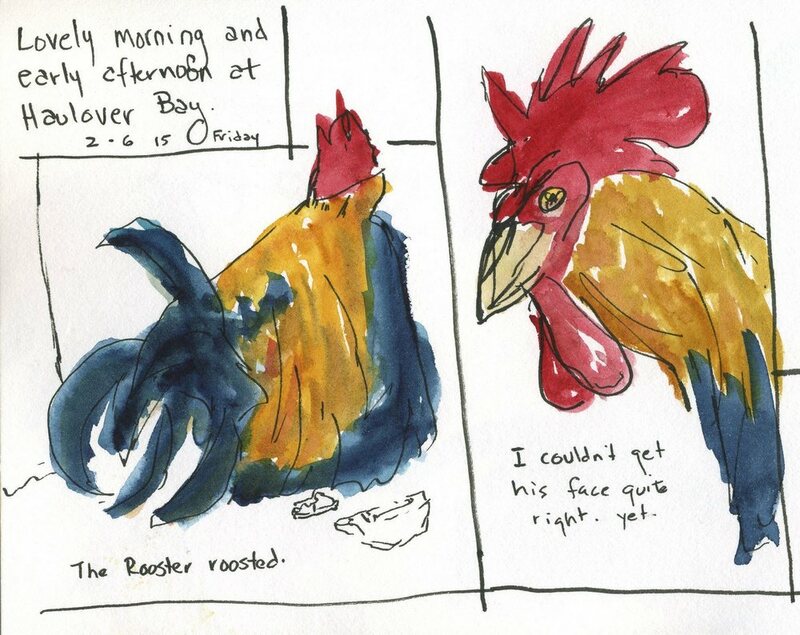 On a recent trip to St. John, USVI, I learned that my favorite beach at Haulover Bay has become the territory of wild roosters. Rather aggressive wild roosters, who have no qualms about hanging around and staring at you, mentally suggesting you should turn over your potato chips immediately. All this posturing and staring made the roosters great subjects for sketching! I thought I'd share a few of the sketches I did sitting right there on the beach. You can read some of my on-the-spot journaling too! Of course, the fun of the drawing above was trying to capture some of the uppity attitude, both in my verbal recording of the experience of these birds, but also in the scribbly painting. I had terrific fun slopping around a wet splashy brush to capture his feathers and flashiness. Next, I did very fast pen and ink sketches. I scribbled all of the little pictures you see below in less than a total of two minutes--he was moving fast and I wanted to try capturing the animal in motion, a skill I really need to practice much more! It was particularly fun to do these quick drawings and then to paint them more slowly. I felt like I was really getting to know the animal more just because I spent so much time really paying close attention to him. I liked him a lot more than I did when I started! Eventually, the rooster roosted, assuming a position and barely moving for a few minutes, which gave me a little more time to really watch him. As you can see from my handwritten comments above, I couldn't get the rooster's head and face "right" on the page for love nor money. Very frustrating. I did snap some photos too... and I hope that I can try again from the still image, just to capture what I could not from the moving animal. 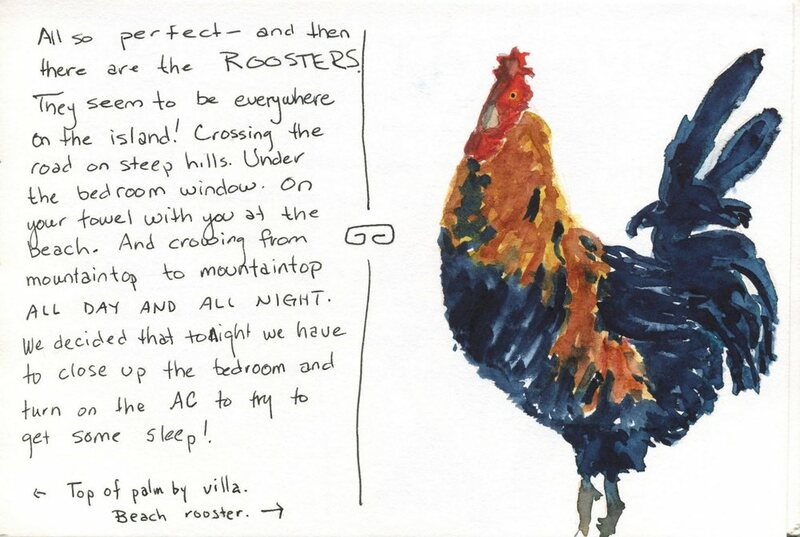 If you want to learn more about drawing animals (and many many other wonderful things related to art journaling), I recommend the blog of Roz Stendahl. I discovered her through Sketchbook Skool, and have learned much from reading her posts. I hope this inspires you to go find an animal and do some scribbling!